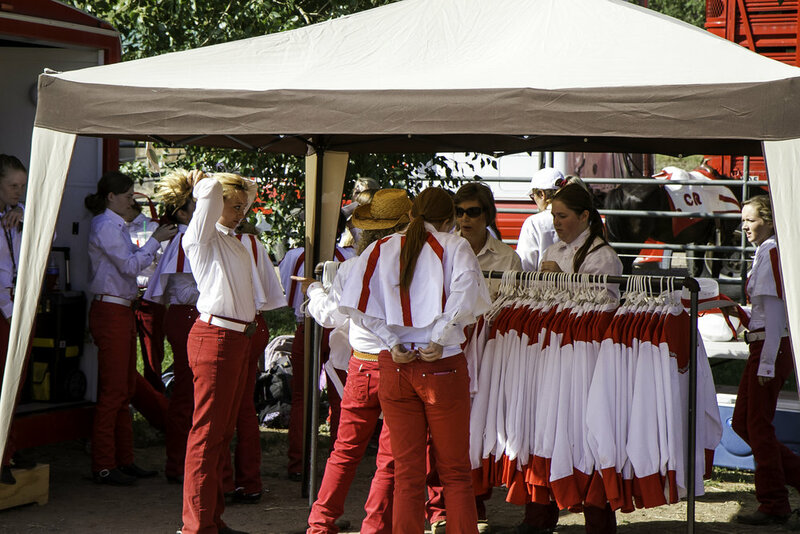 Westernaires is a mounted precision drill organization composed of Denver-area youngsters from 9 to 19 years of age. Founded in 1949, Westernaires has provided training in western riding, precision drills, and horse care for 70 years. Some members also elect to receive training in specialty acts such as trick riding, roman riding, and dressage. In addition to learning about care of horses and honing their skill at precision mounted drill, Westernaires members develop important intangible qualities. These include the discipline that comes from training every week for years to achieve promotion to the top teams of the organization, the sense of teamwork from riding week after week with a group of riders trying to gel into a polished performance, the sense of personal responsibility from caring for horses, and community pride from gaining a personal appreciation for our western heritage. Perhaps the most important feature of the Westernaires today is that it provides a constructive alternative for today's youngsters. Westernaires adheres to a policy of no drugs, no alcohol, no tobacco for its members. There is a sense of community, of family which nurtures young people into responsible community leaders. It provides a place for parents and their children to work together in so many ways that seem unavailable elsewhere. This teamwork between generations is exemplified by the scores of parents and other adult volunteers who make it possible for our young people to ride. Westernaires' horse and facilities caretaker is its one and only one paid employee! The organization trains year round at Fort Westernaire, adjacent to the Jefferson County Fairgrounds near Golden, Colorado. It maintains three outdoor and three indoor arenas, as well as stables for the string of livery horses it owns and rents out to the members on an hourly basis. Fort Westernaire also houses classrooms, a club store, an award-winning museum, and caretakers' quarters. The group is non-profit, with members paying modest annual dues. Every fall, the organization presents the Westernaires Annual Show, a set of fund-raising performances which involve all members, either as performers or helpers behind the scenes. This "Horsecapades" is also our Alumni Homecoming.